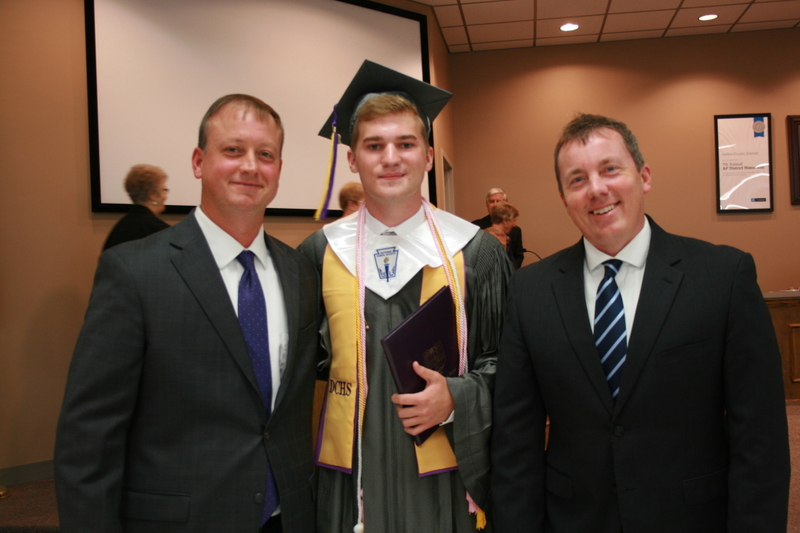 DeSoto Central High School Principal Cliff Johnston and Superintendent Cory Uselton celebrate graduate Brandon Baxter. DeSoto County School Board Members stood and applauded as Brandon Baxter strode to the front of the boardroom, wearing his cap and gown. He attended the board meeting to receive his diploma. DeSoto Central High Principal Cliff Johnston handed it to him and shared his story. Principal Johnston explained that Brandon was involved in an automobile accident on May 9th then airlifted to Regional One Medical Center. Brandon fought for his life just three weeks before he was to walk across the stage and graduate with his peers. Instead, he spent two months at the Shepherd Center in Atlanta. The hospital specializes in spinal cord and brain injury rehabilitation along with medical research and is known as one of the top ten rehabilitation hospitals in the nation. A number of Brandon’s teachers from DCHS attended the board meeting to witness the miracle of his recovery. Mary Kylie Ruff taught Brandon tenth and eleventh grade gifted English. 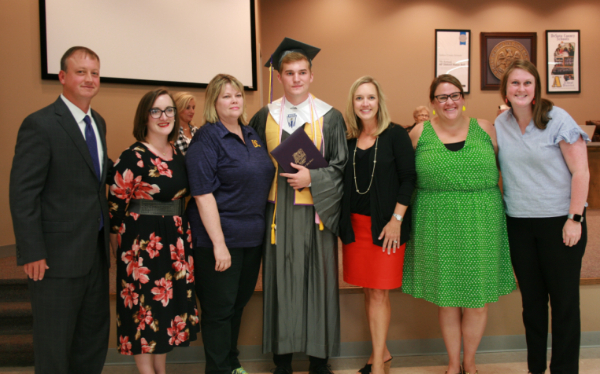 DCHS Principal Cliff Johnston, teachers and counselors Ashley Webb, Tina Campbell, Mary Kylie Ruff, Lauren Springer and Meghan Vaughan congratulate Brandon on his accomplishment. "Brandon is an extremely bright, hard-working student, so it was no surprise that he defied the odds and made a miraculous recovery. Even so, watching his journey from the Med to his graduation ceremony and seeing how the entire school rallied behind him, was an experience that reminded us all how precious life is," Ruff said. Brandon is beginning his college career at the University of Memphis and will be a part of the Memphis Tigers Band. His plan is to major in music education. Nakobe Dean, a 6-foot, 216 pound senior from Horn Lake High School, is a five-star inside linebacker and a scholar athlete. He has had 35 athletic scholarship offers to play football at the top colleges and universities in the nation, including Stanford, Clemson, Alabama, Georgia, LSU, Ole Miss, Mississippi State University, Florida State University and many others. “It would be easier to name the schools that have not shown interest in Nakobe than to list the ones who are recruiting him. I have coached for 25 years, and I have to say, I now have 35 new ‘best friends’,” quips Horn Lake High Head Football Coach Brad Boyette. Nakobe has not committed to a particular school. He plans to make an announcement in December. Coach Boyette has a theory on why Nakobe did not take one of the first scholarships offered. “Nakobe knows by not making a commitment, he has the opportunity to showcase the entire team. This is another example of his unselfish attitude,” Boyette said. Nakobe agrees with Coach Boyette. “Now my boys are getting offers, too." 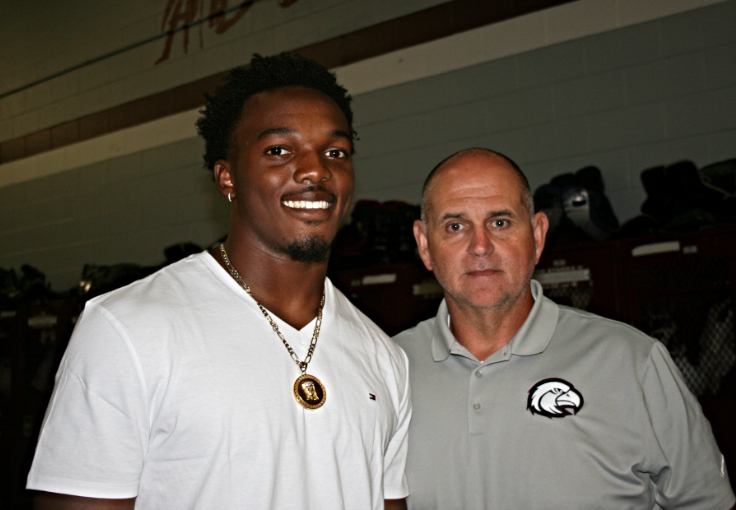 Boyette stated that every head coach and recruiter has come to Horn Lake High for one reason—to see Nakobe. “When they get here, they see our team. We are breaking all of our scholarship records.” Seven starters on the Horn Lake High Football team have Division 1 offers. Raydarious Jones, Tony Washington, Josaih Hayes, Micheal Campbell, Jakivuan Brown, and Matthew Williams have received offers to continue their football career at the college level. There may be more. 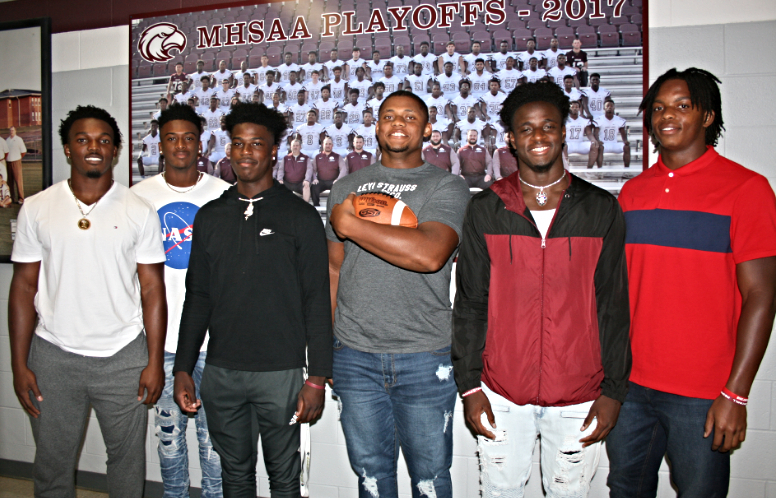 From left to right, Nakobe Dean, Raydarious Jones, Tony Washington, Josaih Hayes, Micheal Campbell, Jakivuan Brown and Matthew Williams. Nakobe says his greatest inspiration is his mother, Neketta Dean. “My mother is strong and she has kept me grounded. She came from a military background and worked in law enforcement. As a single parent, she was strict. My older brother, younger sister and I knew what was expected of us and what we had to do around the house. We also knew we had better be home before the streetlights came on,” he said. Nakobe’s father is a family medical doctor in Florida. They, too, have a strong relationship from annual summer visits. He says his father has helped him think about where he would like to be in ten years. “I plan to graduate from college with a degree in engineering or medicine or play for the NFL. I love math and science,” he said. It is time for open enrollment. Every employee must either complete the online process or meet with an American Fidelity representative. 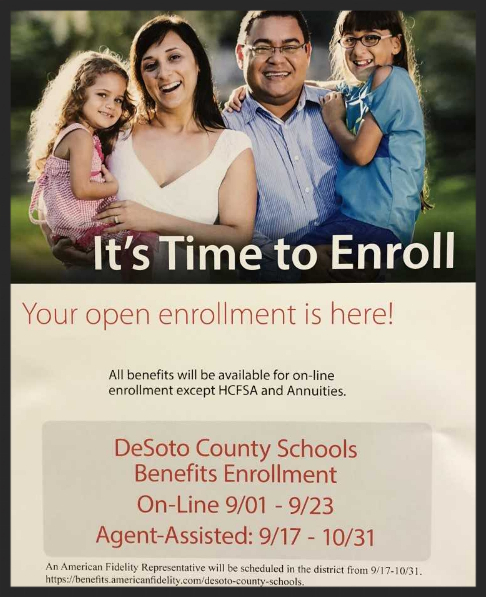 Here are a couple of links to make the process smooth for #TeamDCS employees: DCS Employee Benefits and Online Self Enrollment. 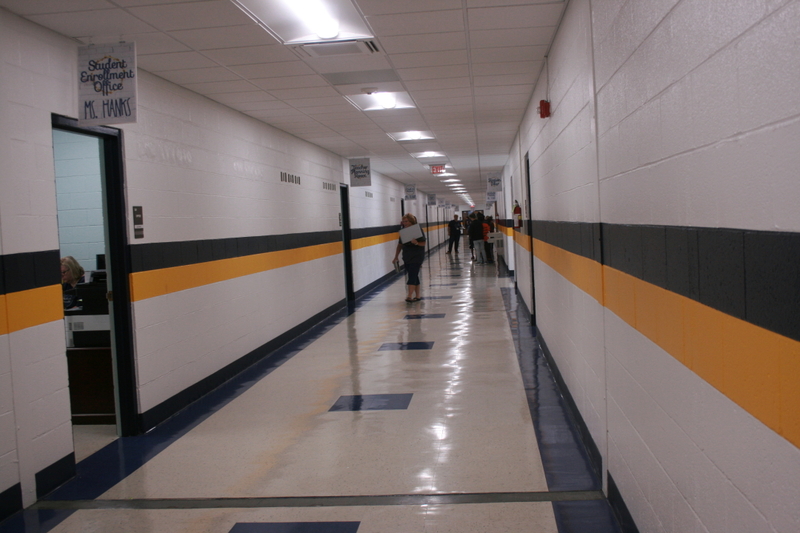 When Superintendent Cory Uselton walked into Olive Branch Intermediate School, his first comment was, “It looks like a new school.” Glancing down the hallways, he saw light, airy, pathways that were brightly lit with sleek LED fixtures. 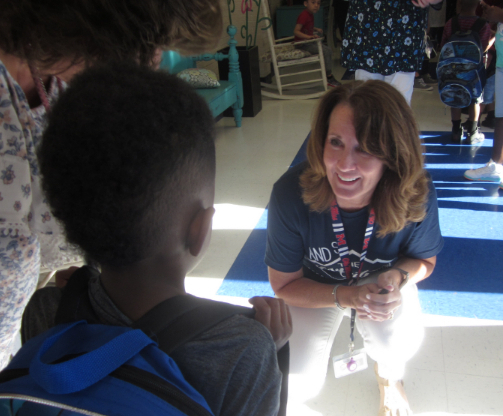 Superintendent Uselton took a tour of the campus to see the improvements in person, stopping to visit with teachers, greet students and answer questions. Over a two-year process, Olive Branch Intermediate School, one of the DeSoto County School District’s older campuses (constructed in 1958), got a top-to-bottom renovation. OBI has been transformed with new wiring, floors, base molding, paint, lighting, wood doors, ceiling tiles, heating and air units, renovated restrooms, and upgraded IT wiring to support interactive projectors. Renovations have taken place during summer breaks. More window replacements are slated for next summer. When complete, the OBI project will total $4 million. Rosie King, principal of OBIS, said, “Our students now have beautiful spaces that make them feel good to be at school. Everything has a clean look. I love the bright white hallways and floors with blue accents. Our creative teachers have added art, living plants, and comfortable seating. We are also appreciative of our fast internet access,” she said. King made functional changes, swapping the library and the music room and changing the administrative offices. “Students need to be in spaces that inspire them. I think the renovations have done exactly that. We still have work to do, but we are making great progress,” she said. King is currently working on converting an underused parking lot to a “rainy day playground,” complete with basketball goals, hopscotch, hula hoops, and jump ropes. Long range plans are to look for grants to establish a STEM program in the former shop building. Having a positive culture at school reaps benefits, according to Hernando Middle School Principal Jerry Floate. “When you have a positive culture, you improve academic performance, decrease behavior problems, and decrease bullying,” Dr. Floate said. Hernando Middle is an “early school,” with doors opening at 6:45 a.m. and a 7:10 a.m. tardy bell. Despite these early hours, club members arrive about 6:30 a.m. to greet their peers with a smile and a handshake as they begin their school day. 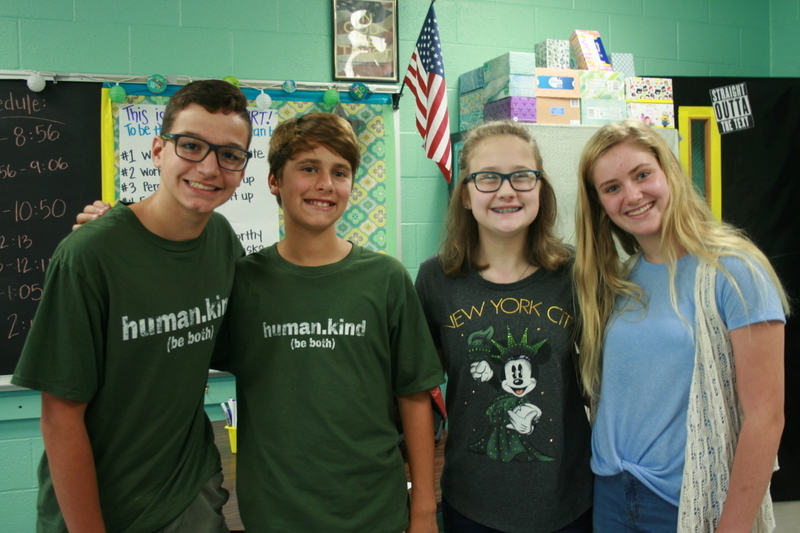 "Every morning someone has said, ‘Hey, why are you doing this?’ I think it's nice for other people to know that you don't have to have a reason to be kind, you just have to do it and make someone's day,” said 8th grader Bethany Wilder. Another club member has collected school supplies and shared them at school. “It's interesting to see how students respond to peers telling them positive things -- not just a teacher or a principal. 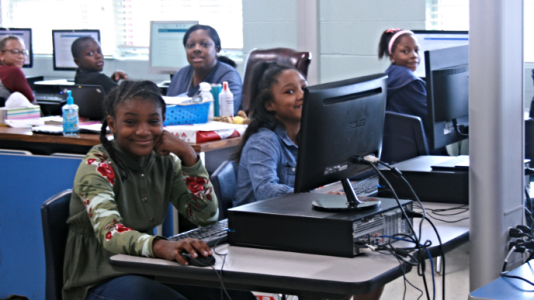 Students relate to other students,” said club sponsor and teacher Cheryl Scott, “Students quickly see they have the same issues and conflicts going on, yet they're able to fellowship over those things and inspire others to be kind as well." The HMS PTA members are on board with the club and supplied “KIND” bars to parents visiting the school for Open House to advertise the new club. "Kindness is like butter. The earth is toast. 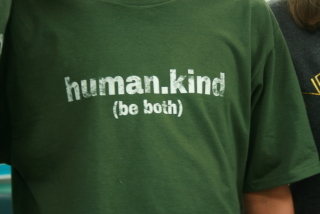 You have to spread it around,” said 7th grader Cody Eaton. Help is only a phone call away if you are an employee of DeSoto County Schools. The program is provided through Guardian, and the number is toll free. Personal and family issues affect employees’ lives not only at home, but can have a huge impact on productivity at work. 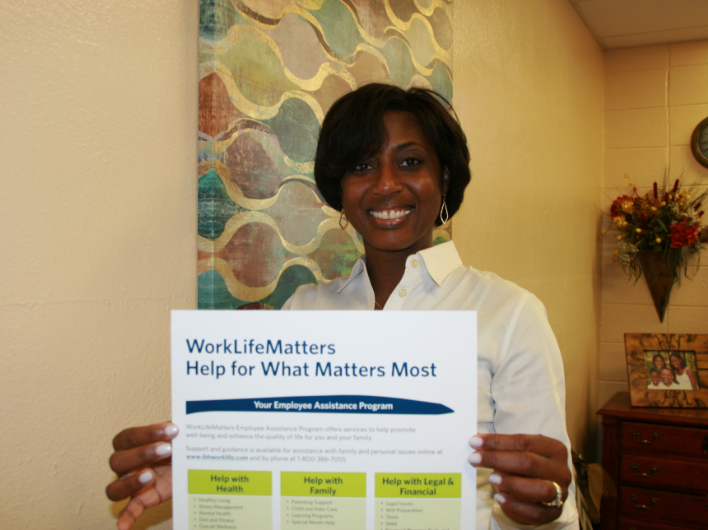 DeSoto County Schools’ WorkLifeMatters program is a confidential support service designed to offer the help that employees and their families need. It is available to all employees, regardless if the employee is enrolled in DCS’ health care program, according to Tajuana Williams, director of mental health for the district. Employees can connect with experienced counselors who will provide extensive professional guidance. A variety of services are offered by an independent national employee assistance firm, Integrated Behavioral Health, to ensure that this support is completely confidential. Help with Health—healthy living, stress management, mental health, diet and fitness and overall wellness. Help with Family—parenting support, child and elder care, learning programs, and special needs help. Help with Legal & Financial—legal issues, will preparation, taxes, debt and financial planning tools and assistance. DeSoto County’s two Chick-fil-A locations teamed up for a good cause. 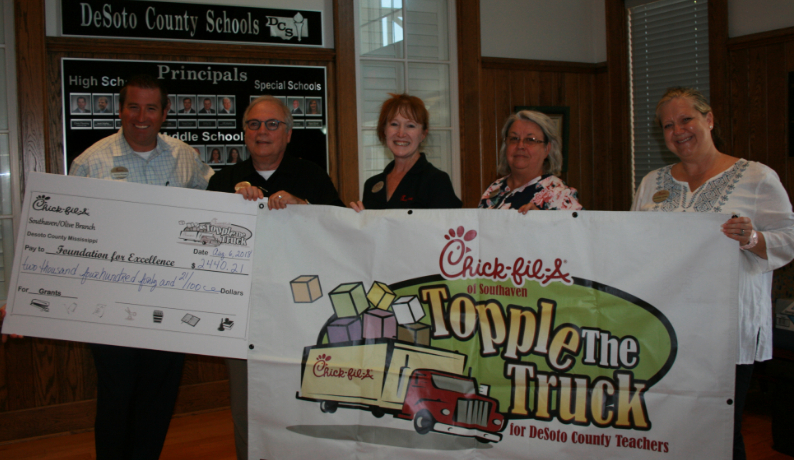 They held their annual “Topple the Truck” challenge to provide school supplies to DeSoto County Schools and raised funds for classroom grants. Customers who donated school supplies received a coupon for a free Chick-fil-A original chicken sandwich. 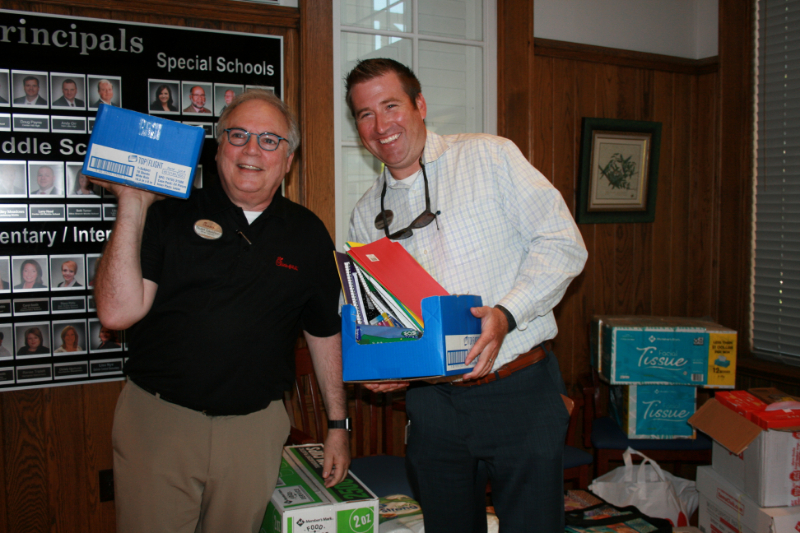 Items donated included packs of pencils, markers, glue sticks, notebooks, facial tissue, hand sanitizer, paper, folders and composition notebooks. From left are Brandon Paulsen, Stuart Davidson, Darnell Alexander, Kay Fox and Kimberly Jones, all representing Chick-fil-A. Southaven Restaurant Operator Stuart Davidson, Olive Branch Operator Brandon Paulsen and their managers delivered the supplies to Central Services and presented a check of $2,440.21. The monetary contribution was a percentage of their combined profits for one day. The funds will furnish classroom grants through the Foundation for Excellence in Education. The grant program, established in 1989, is administered annually by the DeSoto County Economic Development Council. 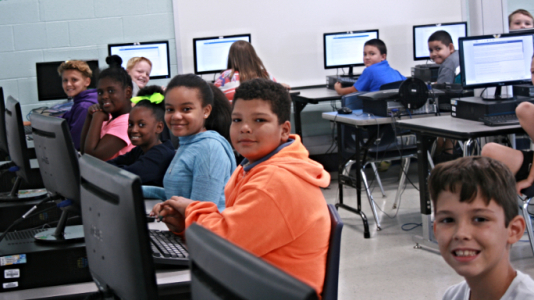 Since inception, the Foundation for Excellence in Education has raised and provided more than $1.19 million for classroom programs in public and private schools in DeSoto County. Third grade students at Horn Lake Intermediate School met one of Memphis’ biggest attractions—the Peabody ducks. 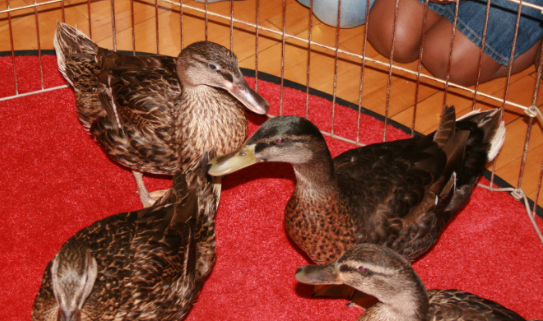 Peabody Duckmaster Anthony Petrina came to HLI, complete with red carpet, a portable fence and music. The ducks marched up and down to the delight of the approving crowd. Telling Ryan’s story keeps his spirit alive. But more importantly, Ryan’s story is about suicide prevention and bullying prevention. John Halligan is Ryan’s father. If Ryan were alive today, he would be 21-years-old. Instead, Ryan ended his life at age 13. Halligan spent one week in DeSoto County, speaking to middle school students during the day, and held parent meetings at night. He shared hard-learned lessons regarding cyberbullying, depression and suicide in hopes that he can prevent bullying and help other parents whose children may be going through what Ryan did. Since Ryan’s death, Halligan has spoken in more than 1,800 schools throughout the United States, Canada and Mexico. He has also authored a suicide prevention bill in Vermont. Horn Lake Middle was one of his first appearances. 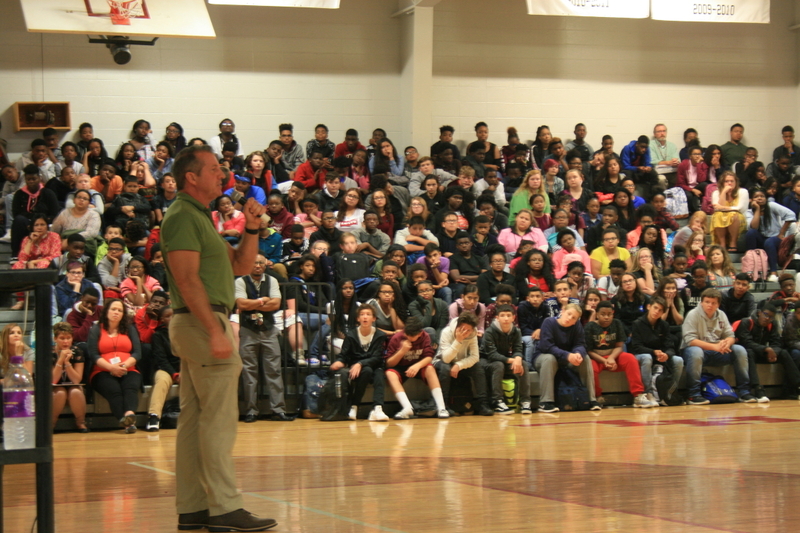 The gym was filled with 1100+ students, and all of students gave Halligan their absolute attention. There was total silence in the bleachers as the painful story unfolded. Students were first introduced to Ryan through pictures and video clips of the young boy growing up before their eyes. Halligan told the students his son started being “picked on” by classmates in the fifth grade. He and his wife watched as Ryan’s self-esteem plummeted. They talked to him and sought professional counseling, thinking they were doing enough. In 2003, they found out they were not. “On October 7th, 2003, my family’s life was forever changed,” Halligan said, “I was not prepared for the phone call I got at 6:00 a.m. when away on a business trip. My wife called to tell me our son was dead. The whole way home, I kept asking how this could have happened. At that point, it did not make sense to any of us,” Halligan said. There was no suicide note. The family began to sift through Ryan’s yearbook and his computer and soon discovered something had gone terribly wrong. Students who said Ryan was their friend were setting him up to be humiliated by getting him to write messages to a girl in their class, sharing and laughing at any personal message Ryan sent her. 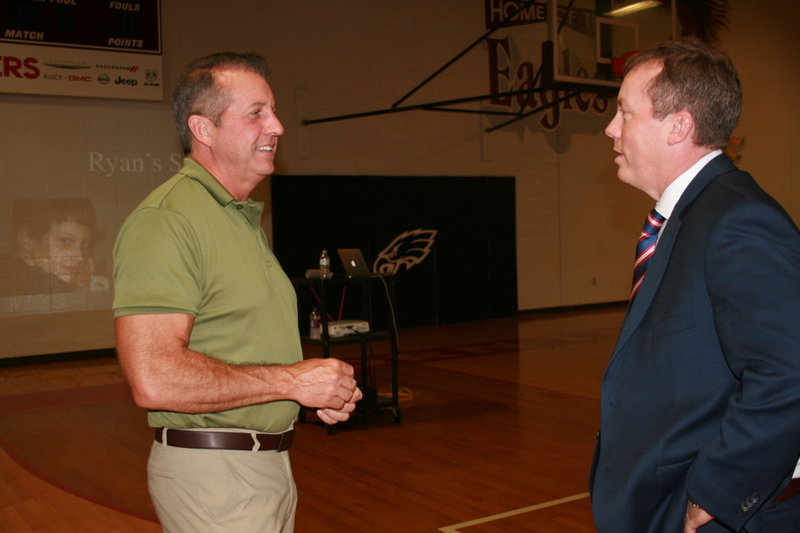 Superintendent Uselton said, "We appreciate Mr. Halligan sharing his moving story with our middle school students and their parents. As educators, we want our students to know about the dangers of bullying others, and we also want them to know how to deal with bullying and how to report bullying behavior. Mr. Halligan connected instantly with our students through his very personal story about his son and cyberbullying, and his message to parents was very informative and timely. 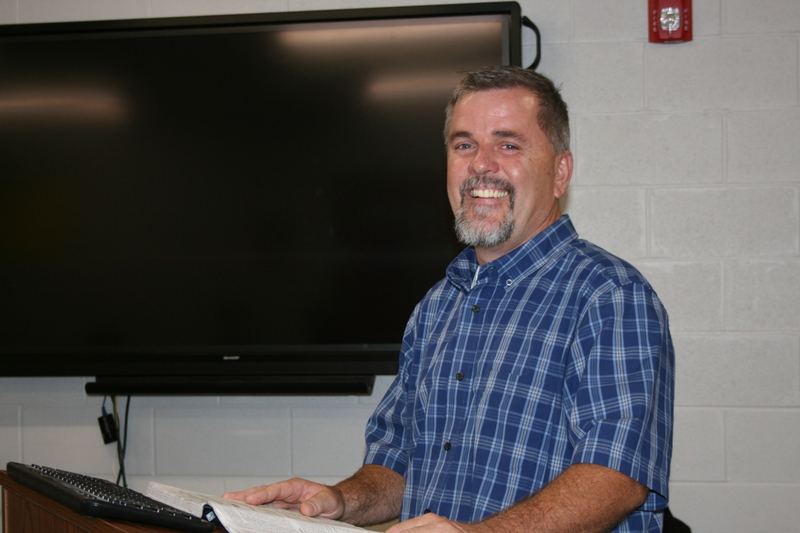 Mr. Halligan made quite an impact during his week in DeSoto County." 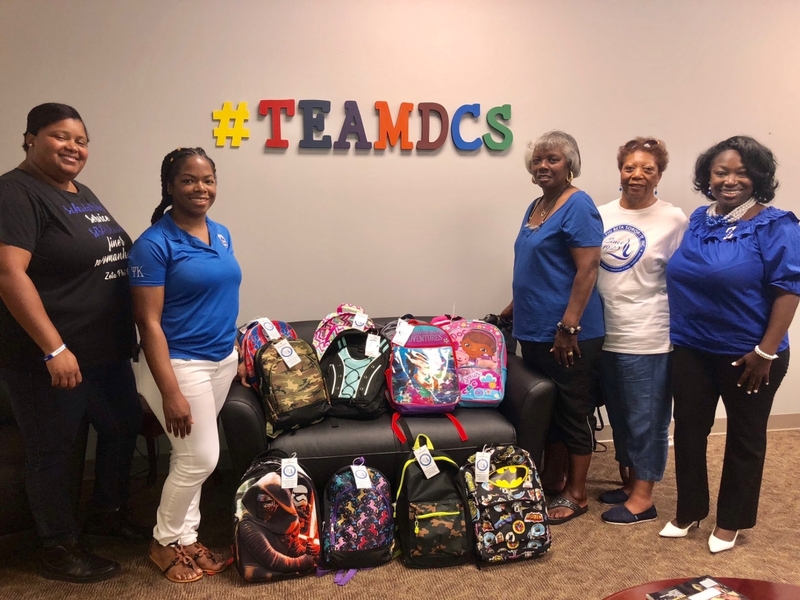 The Zeta Phi Beta Sorority, Psi Beta Chapter, donated backpacks to three locations at DeSoto County Schools—Central Services, Walls Elementary and Horn Lake High. Supplying backpacks to children in need is a part of their organization’s national community service initiative. The DeSoto County Chapter has 74 members. Their president is Neffie Gatewood. Making a delivery to Central Services included, from left to right, Adora Browne, Kimberly James, Christine Carter, Ruby Owens and Neffie Gatewood. 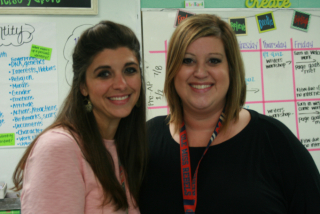 Renee Borden, assistant principal at Southaven Elementary, welcomed a new student. 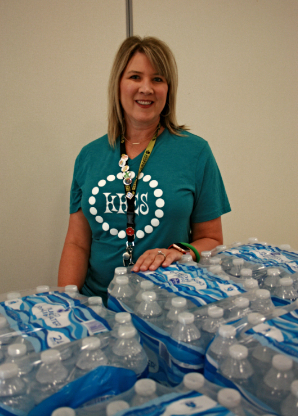 Stephanie Gilder, principal at Hernando Hills Elementary, served water to students when her school got a “boil water alert” the first week of school. The water was donated by Kroger in Hernando. Jay Stafford is the new construction teacher at Career & Technical Center—West. 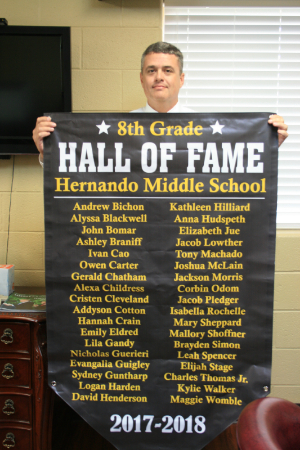 Dr. Jerry Floate, principal at Hernando Middle School, announced his “Hall of Fame” class members for their outstanding test scores. 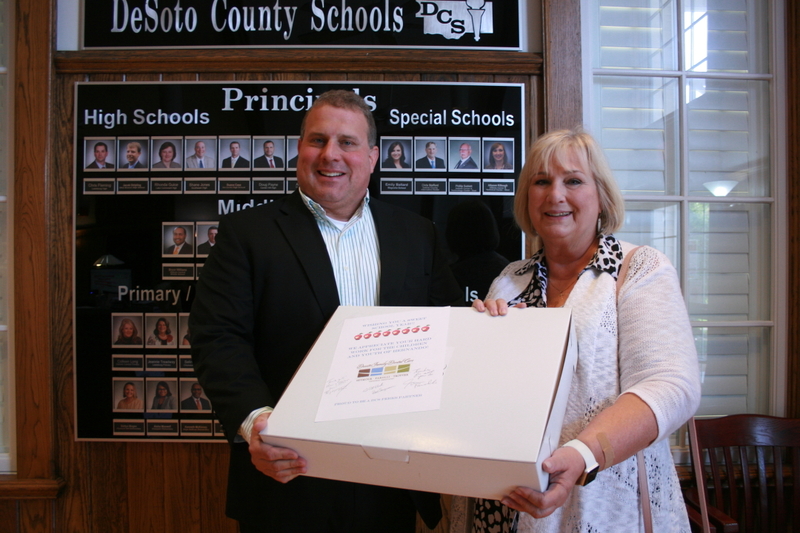 Van Alexander, associate superintendent of personnel, accepted sweet treats for Central Services employees from Carla Samuels, office and operations manager for DeSoto Family Dental Care. Drs. Seymour, Parolli and Trotter are part of DCS PERKS Partners, businesses that offer goods and services at discounts for DCS employees. 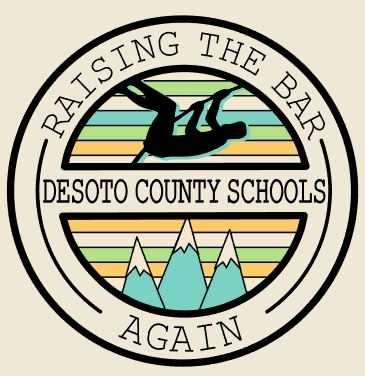 A complete PERKS list may be found at www.desotocountyschools.org. United Way is the largest contributor to the Foundation for Excellence in Education, the classroom teacher grant program. 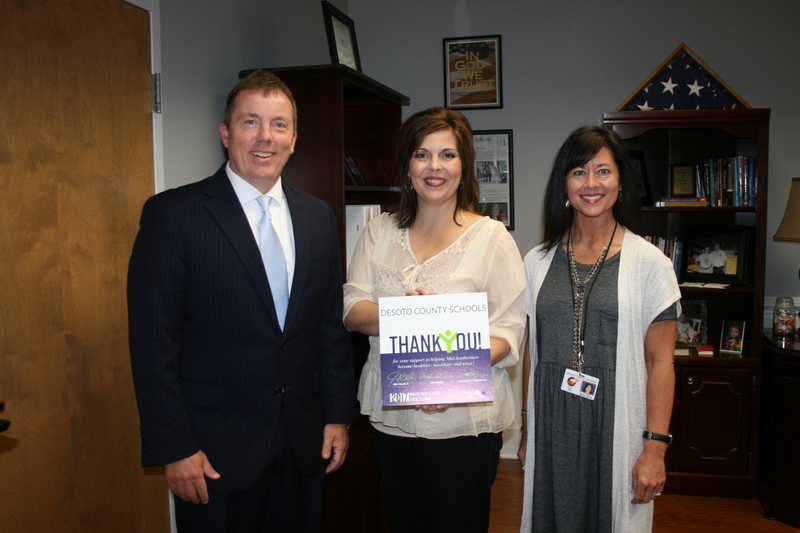 Jennifer Besing (center) with United Way, delivered a plaque to Superintendent Cory Uselton and Community Relations/Social Media Coordinator Geri Hill to thank DCS for continued partnership. Many employees are enrolled in a payroll deduction program for United Way and volunteer to help with United Way programs.